Reward from Dalaran cooking daily, contains some Northern Spices(got 6 from mine) and possibly a cooking recipe (mine today is chocolate cake! yay!). Mine contained a nice surprise today - A second Dalaran Cooking Award.. In addition to that, they can also sometimes contain the purely cosmetic items Old Spice and Baby Spice. This bag always contains a few Northern Spices, at least every time I've done the daily cooking quest. Northern spice is required in all cooking recipes above 400 skill, so anyone looking to max in Cooking should start doing the cooking dailies as soon as they can to accrue spices and tokens. Not only can you unlock new recipes by saving up Dalaran Cooking Award tokens, but you also purchase 10x Northern spices per token. The amount of spices you get in the goodie bags is not enough to level cooking at a reasonable pace (ie: stacks of uncooked food will be sitting in the bank). Old spice gives your target a buff: Old Spice; "Smelling Great", and baby spice shrinks your target, both lasting for 5 minutes. Hopefully I can score a cake recipe sometime, since the old cooking dallies are mean. it's a parfume for men and it does indeed smell "nice". is a reference to the Spice Girl "Emma" - She's always been the baby, because she's the youngest..
have to correct you on that one, it costs 2 gold and 10 cooking awards, unlike all the other recipes that only cost 3 cooking awards. Currently, on live servers, the Delicious Chocolate Cake recipe cannot be purchased from a vendor. It doesn't always contain Northern Spices, but it does always contain some sort of spice. Has anyone actually gotten a Dalaran Cooking Award yet since 3.0 went live? I've been doing cooking dailies every day since I hit 74 and I have yet to get a single one from the Small Spice Bag - only spices. This will contain usually 3-5 spices in total of the three listed. This may also contain the nutritiously humorous recipe, Delicious Chocolate Cake, for those who didn't get it in the Burning Crusade cooking daily bag rewards. Your other "lucky" ticket is another Dalaran Cooking Award. This has not happened for me yet, after 15 times finished. Mostly for fun, but Baby spice works on mechano choppers and traveller's tundra mammoth. WoWhead has said that the recipe for the chocolate cake only have a 1.1% chance of dropping. In addition, when it says that Northern Spices has a 229% chance of dropping, you will receive northern spices in different loot slots, such as. You receive loot: Northern Spicesx2, which would be counted by WoWhead Client 3 times. Well, atleast Baby Spice seems to only last for 30 seconds. FWIW I have done the cooking daily every day since I hit 74, which was probably about November 20th, so that is about 2 weeks worth of doing the daily. I have seen the extra cooking award drop 3 or 4 times, but to date have not received the cake recipe, which I also never received during BC despite doing the daily numerous times. Blizzard claims to want to reduce the effect of RNG in the game by removing things like stun resist, instead the applicable stat is now stun time reduction, but then they leave things like this as a drop, and I don't consider that to be consistent. I contend that this should be available for 10 cooking awards, or removed from the requirement to earn the Chef title. Baby spice FTW - escpecially usefull agaist goddam Taurens on their overstuffed mounts sitting on top of mailboxes and NPCs. A nice PvP perk to make you and/or your pet harder to target. I never got the cake recipe in BC cooking dailys, but on my second or third day of wrath dailys i managed to pick it up. best of luck to those who still need it. Any idea what the limit is on how many spices can drop? in one, but never more than 6 Northern total. Any idea if it's possible to get Northern x2 5 times? It seems as though the the Northern Spices are on a separate loot table from the Old Spice and the Baby Spice, and the Dalaran Cooking Award is too. I got this today, but didn't bother taking a screenshot. I'm not sure about the chocolate cake recipe, seeing as I got in TBC. Recipe: Delicious Chocolate Cake is listed with such a low drop rate because many people have gotten it previously via either the Crate of Meat or the Barrel of Fish (from the Cooking Dailies from The Rokk). Heck, once somebody gets the recipe (even from the Small Spice Bag), the drop rate goes down with each successive looting. As usual today i did the daily cooking quest, Sewers Stew. I've take several tokens from this bag but only one at the time, i was surprised to see that today I got 2! I'm lucky or they've change something? I have heard rumors that the Recipe: Stormchops can also be obtained from here just like the Delicious Chocolate Cake recipe since they were both blue *I got my cake recipe from Shattrath, so idk, but it seems like it drops here*, but the LAST Outlands recipe I'm missing is stormchops... Can anyone confirm if it drops from the spice bags or not? My source of the rumor was from the comments posted up for the Recipe: Stormchops item. In the "contains" section for this item, it says Dalaran Cooking awards are a 20% drop. For me, out of 26, i've gotten one. Coincidentally, it dropped on my 25th bag. Am I just unlucky that I haven't got more or are the numbers here skewed? Did bliz change it so you get an extra every 25 bags or something else like that? I can confirm that i did indeed get the recipe for stormchops from a small spice bag as a reward for the quest "mushroom infused meatloaf"
I got stormchops yesterday. So yes it does indeed drop. Perhaps blizzard changed the drop rate with the patch? Normally I stay away from questions about random chance, but at least personally I've noticed a huge increase in the number of cooking awards I'm finding in the bags. I'm running about 50% over the last 12 days or so since the patch. Is this just the RNG being overly kind to me, or are other people seeing this as well? I did 115 cooking dailies and received no recipes. Only one person in my entire guild had the cake from dalaran. Since the patch (3.0.8) I have now got both stormchops and delicious chocolate cake - and two other guildies have as well. I'm not sure if rates changed or we are just getting very lucky. Old spice is also a deodorant for men. I usually receive three to four Northern Spices from these bags, and after about a month of doing these dailies every day, I got the Recipe: Delicious Chocolate Cake. Okay I know most likely it's just the RNG not working for me. It's just I have been doing the cooking quests for the last two weeks and have yet to see Baby Spice or Old Spice drop. I have seen the award fairly often and get 4+ Northern Spices a bag, but so far no luck on the others. This happen to anyone else or am I just failing bad at the RNG? I have been doing the cooking dailies in both Dalaran + Shattrath for 3days running now + either i'm just lucky or they upped the chances of http://www.wowhead.com/?item=33925 - Got it on my 3rd/4th try. Today the Small Spice Bag contained a Recipe: Captain Rumsey's Lager on one of my characters that never picked up the fishing profession. Very pleasant surprise and good news for those who don't want to spend time fishing to get this recipe. At the moment it isn't mentioned in the Contains List but I guess it will be updated soon. Ive done the Cooking daily quest now for a week and ive goten 3 recipes from small spice bag!
! Nr1 and Nr2 i got in the same bag! with some northrend spice and some Dalaran Cooking Award! :) ! Dropped from this today, i got no idea why! -any ideas? Oh noes, something dropped and you have no idea! This is really weird! Why did it drop from the bag? IT WAS ADDED IN THE LOOT TABLE FOR IT! Sidenote: Yes, this recipe has been added to the random loot of this bag. I got it from this also, even though it is not listed to get from the bag. Either I'm really lucky or the rate was increased, but i got the Recipe: Stormchops on first daily, so it doesn't look as hard as it seems. Keep in mind that the Northern Spices are not soulbound, if you have a shortage of Northern Spices then buy them at the AH. Don't waste your Dalaran Cooking Awards on them. It seems that as of patch 4.01, these no longer have a chance to contain a Dalaran Cooking Award. The Dalaran Cooking award achievements are working again (but they do not seem to count the ones received during patch 4.01) and bonus awards are dropping again from the spice bags. I also received a quest starting item (a wine bottle label) from the fishing daily bag and it started a quest you need to turn in at the cheese shop. Reward was 7 gold and some silvers and 5 Dalaran cooking awards. I haven't received any Baby Spice or Old Spice the last week or two I've been doing the Dalaran Daily Cooking. Maybe it's the RNG Gods really laying down punishment. 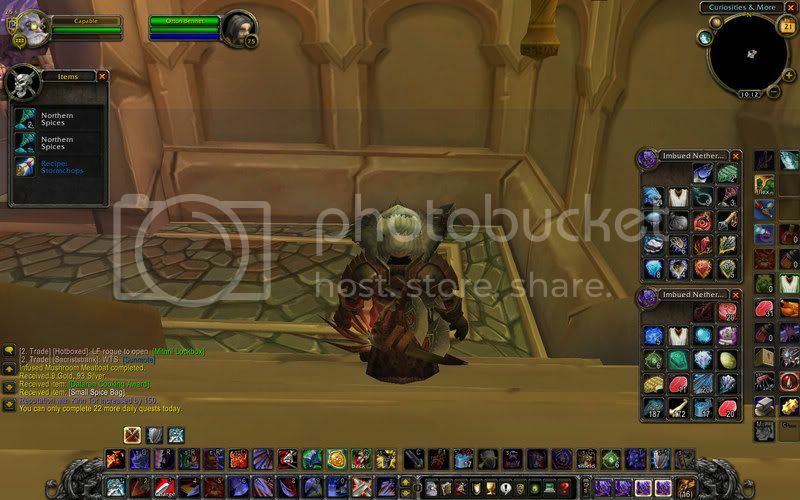 Have anyone been doing the Dalaran Cooking and not received any Baby Spices/Old Spices either? It seems that opon opening this bag you also receive Epicurean's Award can anyone confirm? Epicurean's Award isnt currently shown on loot tab of the Small Spice Bag when opened..
EDIT: This is confirmed indeed, open opening receive's another Epicurean's Award to compensate for the daily cooking quest's only rewarding 1 Epicurean's Award i guess ..
You can buy these from Auzin now as well. They go for 25 Timewarped badge per bag. Makes getting them a lot faster than just doing the dailies.